Today’s the day…it’s my day to share for the Home for the Holidays blog tour, and I’m thrilled to show you around our stone cottage dressed for the season. We just moved into our 1946 stone cottage in July, so this will be the first Christmas we’ll be spending in our new home. I’ve been so excited about decorating and creating our cozy Christmas cottage that I may have started 2 weeks ago, which is the earliest I’ve ever started decorating, but it’s been fun taking my time and finding the perfect spots for all my holiday decor. (You can check out last year’s Christmas tour of our Illinois home HERE). I’ve also added a Source List at the very bottom of the post. Our house is definitely a work in progress, which means some rooms are half painted (sad but true), there’s quite a few large, spackled holes in the walls that have yet to be sanded and the beat up front door still hasn’t been replaced, but it hasn’t dampened my holiday spirit. Our family has lived in a lot of homes over the years and, although it’s not the smallest house we’ve lived in, it’s definitely been the most challenging when it came to the all important tree placement. You see, we have a tiny living room…tiny. There’s only room for a couch and a chair so adding a big tree, or even a little one, was out of the question. We discussed putting it in the sunroom but that’s tight too, so the only spot left was the dining room. Not the most ideal and definitely not the best when you’re sharing on a blog. I mean, you can’t help but look on Instagram and Pinterest at all of these big beautiful family rooms with gorgeous 75 foot trees all decked out and ready for a magazine photo shoot. I have to admit, I love looking at them too but that’s not our reality. So it was either the dining room or no big tree at all. Not having a big tree wasn’t an option, for me anyway (although the hubs has a different view), so we started a new trend and put it in the dining room. I was a little bummed when it first went up because I’m so used to seeing it in the living room, but we spend a lot of time in the kitchen and dining room, so now we get to eat dinner by the twinkling of the tree lights. Not a bad trade-off. We bought a new, slimmer profile tree last year from Balsam Hill and I’m so glad that we did. If we’d had a bigger tree, it wouldn’t have fit. I kept the tree pretty simple this year. Red, silver and a bit of gold, including the mercury glass ornaments that I made, and a bit of rustic, like the stick ornament I made last year. I guess it’s a little bit of everything. So, since the tree found it’s home in here, and we spend so much time in this space anyway, that’s where most of the decorating took place. When we first moved in, I envisioned this window decorated for the holidays with a beautiful live garland. It’s my favorite thing in the kitchen right now. I used a lot of the holiday decor I already had packed away. Having never decorated this house for Christmas before, I didn’t want to go crazy and buy all kinds of new stuff that I didn’t need. I usually end up decorating with a lot of natural elements anyway, and don’t like to spend a lot on new decor that I don’t have room to store. So, that’s our cozy Christmas cottage all dressed up for the holiday season. I’m ready to enjoy it and make new family memories in our new house. I’ve been busy decking the front porch too, and I’ll share that sometime next week. 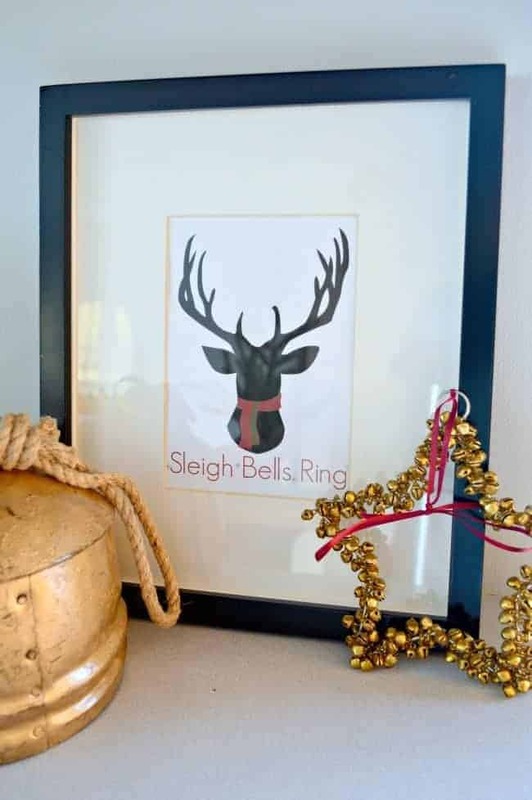 I also made the faux deer antlers that hang in the entryway and shared a free holiday printable so be sure to check them out, HERE. Odd time for a christmas comment, i know, but am reading up on your back issues…enjoying. I love reading christmas in summer as i plan for next year. I love your tree in the dining room. I always put a tree in the dining room as that has a window on the front of the house and we love the lights in there. everything looks pretty and festive on your christmas post. Never an odd time for a nice comment. I think about Christmas decorating during the summer too (I was just looking at past photos last night), so I understand. I wasn’t sure about the tree in the dining room at first, but I really loved it there. It’s the only spot for it in our small cottage, so it will likely be there this year. Kristin it all look so warm and inviting! I hear ya on the challenges of a new home. We down sized a bit as well and went to an open floor plan so I am having trouble placing things. We too had to slim down our tree so I purchased a slim one from BH. I love your kitchen window! It is beautiful. I wanted to use the same in our breakfast nook but by the time I got to decking the halls in there I could not find any. There is always next year! :) Hope you and your family have the merriest of Christmas’s in your new home! Thanks so much, Pamela, I appreciate your sweet comment. Your new home looks beautiful decorated for the holidays and your new tree is perfect for your space. Moving into a new space is always challenging but it’s so much fun. I’m still moving things around and looking for the perfect spot for everything. I’m just trying to take my time and enjoy the process. Congrats on your new home and best wishes to you and your family for a very Merry Christmas! OMG Kristi! It seems like you’ve lived in this house forever!!!! Love every little detail you added for Christmas! Also love your new profile pic! Beautiful! Have a merry Christmas! Awww, that’s so sweet. Thanks so much, Vel. We definitely feel comfortable in our new house. Once I get the walls painted, it will really feel like ours. Hi Dawn. The dining room is the perfect spot for the tree, and currently the only available spot. 😉 I like your idea to move it to different spots around the house. I’ll have to see if we can work something like that out. I love those grain sack stockings too. I got them from a fabulous flea market in Oakland, CA. I wanted 4 but got the last two. I haven’t found any others that I care for like these. I think you have the right idea about making your own. Thanks for stopping by. Merry Christmas to you! you have a lovely home and I really like the tree in the dining room When hubby and I were starting out we lived in a cute little house but it was only 968 sq ft. We had to lose a precious sitting are to put up the tree. I added some ottomans when guests came over and hubby and I sat on them leaving the couch and one other chair for our guests. I’m visiting from Oh My Heartsie Girl today. I invite you to stop by Katherines Corner and enter my giveaways and add your lovely blog to my party on Thursday too. Hugs! Thanks Katherine! It sounds like you have experience with decorating a cozy house too. It’s been fun but quite challenging. Merry Christmas! Your home is lovely and decorated so beautifully. Thanks for sharing at the Inspiration Spotlight party! Pinned & shared. Thank you for sharing at Inspire Me Monday. I wanted to let you know that you are one of my featured picks this week. Come check it out. That’s awesome! Thanks so much!!! Everything looks so warm and cozy! And even though the Christmas tree in the dining room is really different, I can just imagine how cozy it is eating next to it! 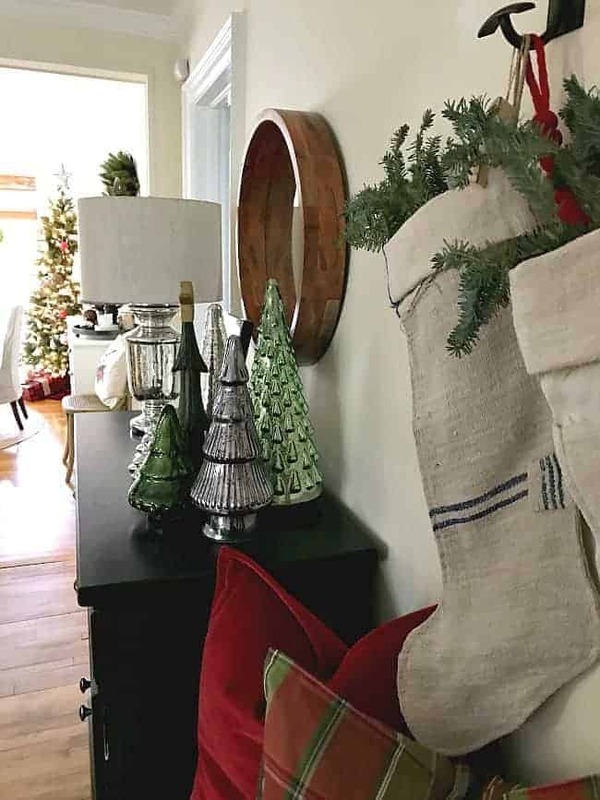 OH WOW, you did such an amazing job decorating for christmas and I can feel the love that is in your gorgeous home! Awww, thanks so much, Kristin. We are really loving our new little cottage. may I ask where you found your pillow with the red truck and Christmas tree printed on it. I’ve been searching for one for ages and can’t find it. I love what you have done with the house, gorgeous! Everything looks so pretty and festive and I’m sure you’re excited to be in a new/old house. Love the hot cocoa stand and the slim tree. And you kitchen is beautiful! Have a merry Christmas! Stopping by Sunday’s Best Linkup. I love your decorations, especially the star made from the bells. 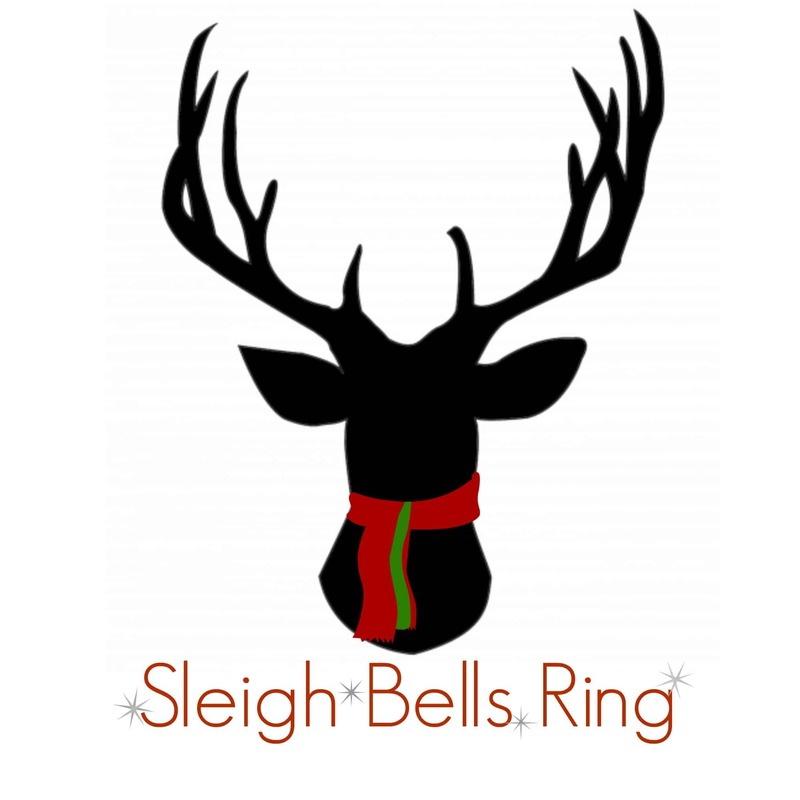 I would love to see a tutorial on how to make those Jingle Bells. Thanks for sharing! Thanks so much, Rhonda! There isn’t a tutorial because I didn’t make the star made from bells. I think I got it at Walmart, but it was several years ago. Sorry. Such a cute cottage. LOVE your kitchen!! Thanks, Jennifer. The kitchen is our favorite spot in the whole house. We love the openness. Your home looks lovely, Kristi! It has a very warm welcoming holiday look. I especially love all the well placed deer decor pieces. Thanks for sharing at Snickerdoodle Create~Bake~Make Party. Pinning to my Christmas Board. Thanks so much, Beverly. We are enjoying our first Holiday season in our new home. Stopping back by to let you know that your Cozy Christmas Cottage Tour is our Most Clicked Feature at today’s Snickerdoodle Party. All the co-hosts will be sharing your post. Hope to see you there! So exciting! Thanks so much, Beverly! Your home looks lovely! 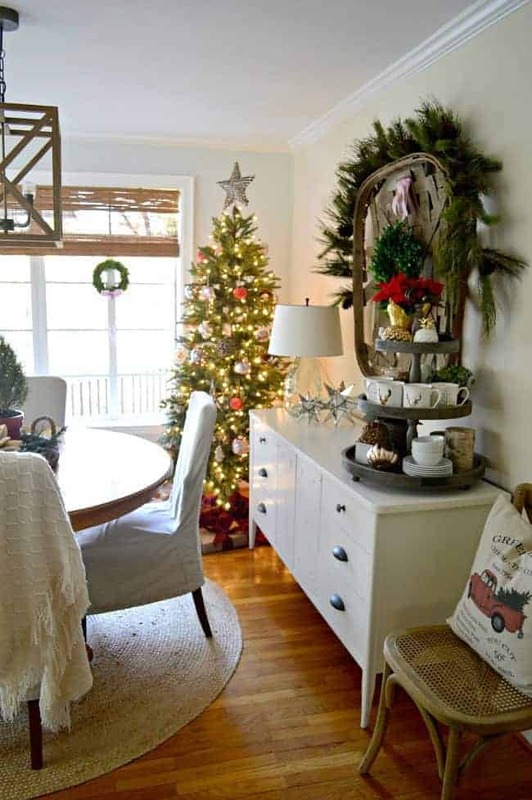 I adore the thought of putting the tree in the dining room! Thanks Emily! I was a little unsure at first, but I’m loving it now. Awww, thanks so much for the sweet comment, Lidy! I’m excited to share the first Christmas in our new home with our family and friends. Wishing you a wonderful Holiday season with your family in your beautiful home! Kristi! You totally nailed the cozy cottage vibe! I want to come hang out in your home! 😉 Happy Holidays to you and enjoy your beautiful home! Your home is beautiful! I also have to put my tree in the dining room. My home was built in 1848,so the rooms are small. I put my tree in a container so there is room for the gifts and we can still walk around the table. We also have a pellet stove in the living room so our tree would dry out. I have so many ideas from your homes dealing with small spaces. I put a picture of my pellet stove mantel on Pinterest, I am surprised how many people have repined it! Small spaces are just as pretty as a huge home. Thank you for all your ideas! My mantel has the words home and inspire with two black and white pictures above it. Search pellet stoves and please let me know what you think! Happy Holidays to you! I saw your pellet stove on Pinterest and can see why it was pinned so much, it’s awesome and your mantel is beautiful! Congrats on its success! 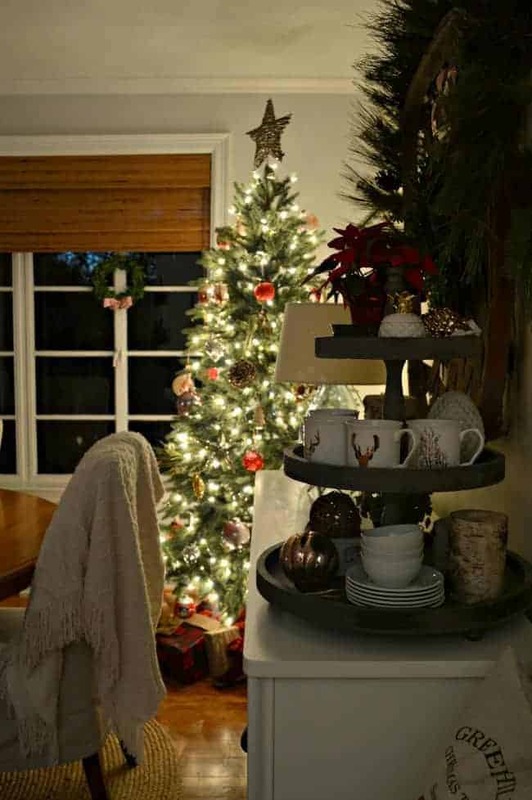 I love the idea of dining by Christmas tree light – so romantic!! 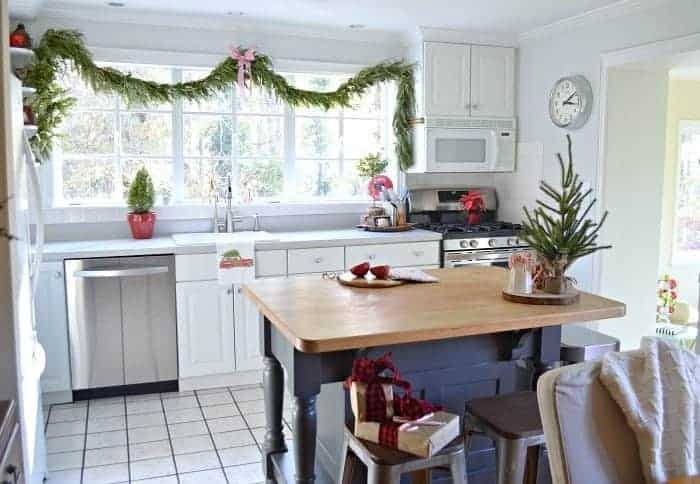 Your kitchen is spectacular – that garland is dreamy!! Congratulations on your new home – I’m having my first Christmas at our new farm this year too! It’s exciting getting to know your new house, isn’t it?! So fun to be on the Holiday Home Tour together! I agree with you, it’s so exciting getting to know our new house. Wishing you a joyous first Christmas at your new farm. 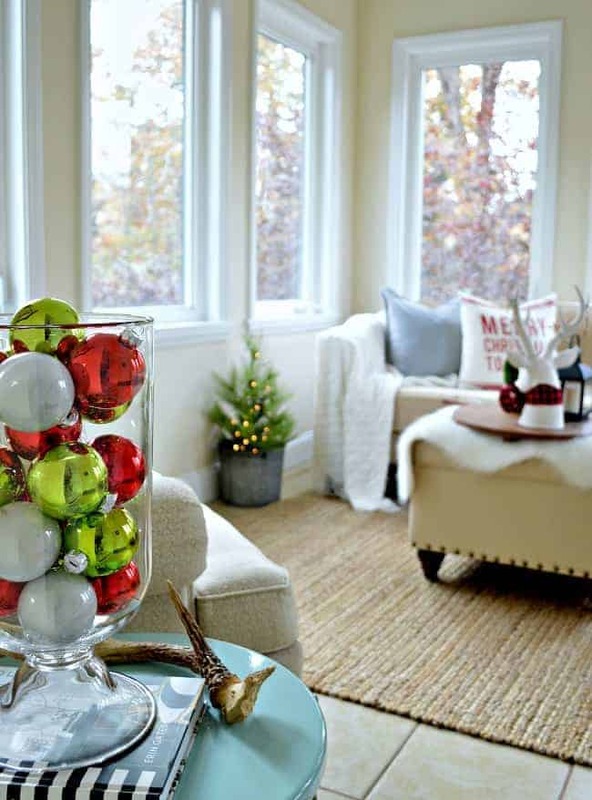 Your Christmas home tour is just beautiful and so is your home. Thank you for sharing so many great decorating ideas. Thanks so much, Leanne, I really appreciate it! Good Afternoon Kristi, I live in England so I am used to living in smaller homes, so your home does not feel small to me. I love to see all the large decorated Christmas trees in homes that have so much space, but for me that is ‘eye candy’, because no one I know lives in such a house. Like you, I have moved many times during my married life and I always find it exciting to find new places for our treasures. Now I have to tell you, we have our Christmas tree in the living room when our family are with us, but when we are on our own, we have the tree in the dining room, which is attached to my kitchen, so it works perfectly because I can enjoy my Christmas tree whilst I am cooking. Your home is beautiful and your have decorated it in a beautiful style. Happy Holidays and my best wishes to you! You need not worry about your Christmas tree placement…as it is gorgeous. Your 1946 cottage is just beautiful in its holiday splendor! Everything looks just wonderful, Krist! I think your tree is in a perfect spot. Having been in your home, I can just imagine seeing it as soon as you enter your front door. I’m totally envious of your tobacco basket and love the way you draped it with garland. And the window above your sink? Well, you already know that I’m totally envious of that! Love every single thing you’ve done! You are too sweet, thanks so much, Suzy! Coming from someone who does such a fabulous job on her gorgeous holiday home every year, it means a lot. Hugs! Your home looks so cozy and welcoming for Christmas! Thanks so much, Maryann, I appreciate it! I like the Crhistmas tree!!! Also I like your new picture at the end of the blog. Hope that you and Mark are doing well. Love it all, especially like the live greens in the kitchen window. And by the way, love the new profile picture it is very glamorous. Awww, thanks Debbie. It’s always a bit frightening putting a picture of yourself online for the world to scrutinize see. The greens in the window are my favorite too! Your home looks beautiful decorated for Christmas. 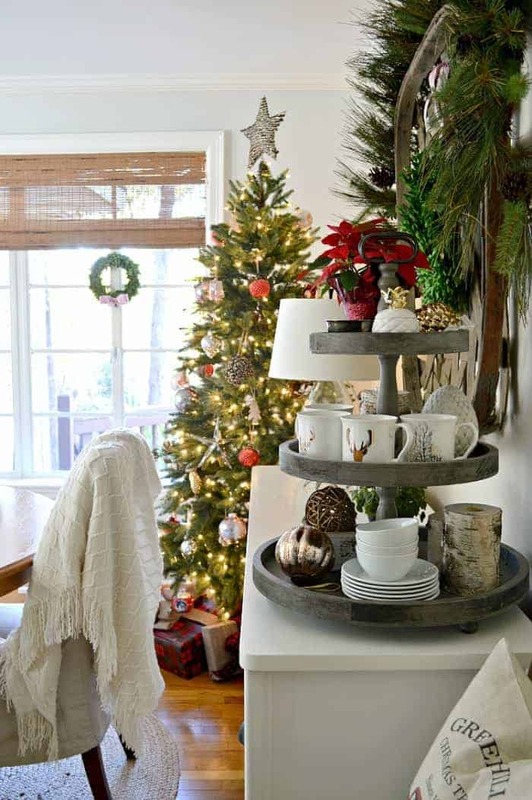 I like the idea of having the tree in the dining room and it really works in your home. It all looks so nice! Your home is simply beautiful! Thanks for the free printable! So gad to have you on the HFTH blog tour this year!! Thanks so much, Sondra! And thank you for putting so much into getting the HFTH tour together. It was so much fun! Love your home! I think the dining room is a perfect spot for the tree! That way you get to sit and admire it every night! Our living room is small too, I understand your tree envy. We will never fit a big fat tree into our living area so we settle for a tall skinny one and put a larger fresh tree on the porch where we can see it through the window. All is good! Merry Christmas! Thanks Jessica! Now that the tree is in the dining room, I think it’s the perfect spot. I like that we can eat by the Christmas lights and I can also see it right as I walk into my from door. All is good. That’s a great idea about putting one on your front porch. We’ve never had one big enough but we do now. I’ll definitely have to visit that idea next year. Thanks so much for stopping by. Merry Christmas to you! 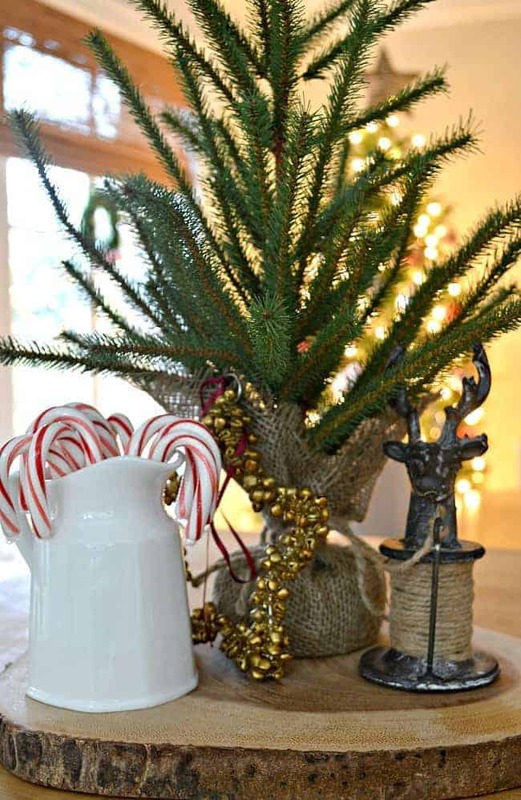 Kristi, I love your little cottage and how you have made it so cute and cozy for the holidays. Thanks so much, Kim. It was fun decorating it for the holidays. I’ll be sad when everything has to come down. 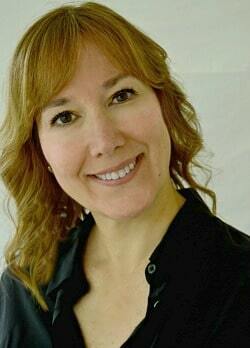 So beautiful, Kristi, but you already know how much I love your classic style. You have a great eye and always manage to make everything look like it just popped off the pages of a magazine. Speaking of…look at you cover girl! Your new photo is fabulous. I actually like the tree in the dining room where it can be seen from the kitchen and where you dine. Sometimes we feel as though we are the only ones without the huge family room with the huge fireplace and mantle and the huge tree that is perfectly decorated in a spot seemingly made for it. That is not reality for most people. I happen to love your cottage, small rooms and all and I can relate to not having the perfect spot for a big tree. I’m in a 1200 sq ft ranch so my medium sized tree tree is located between the living room and dining “area” where it is seen from pretty much everywhere other than the bedrooms. Perfect? No. Cozy? Yes. And, only up for a few weeks each year. 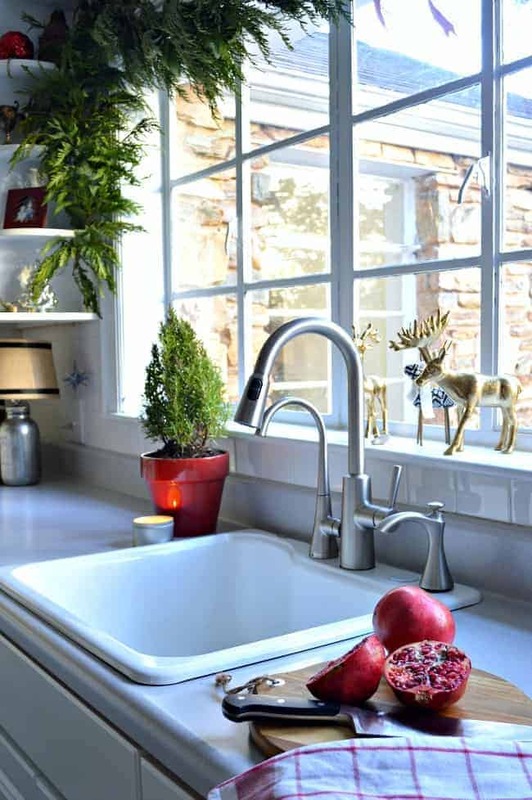 Enjoy your home and smile as you work in the kitchen and bask in the glow of your Christmas tree all at the same time. Merry Christmas and Happy New Year. Thanks for sharing your thoughts on this. It can be a bit scary putting yourself out there and revealing your truths, and your house, to so many people, but I have the best readers around and they are always so kind and supportive in their comments, you included! 🙂 Thanks Pat! Thanks, Deborah, I appreciate it! 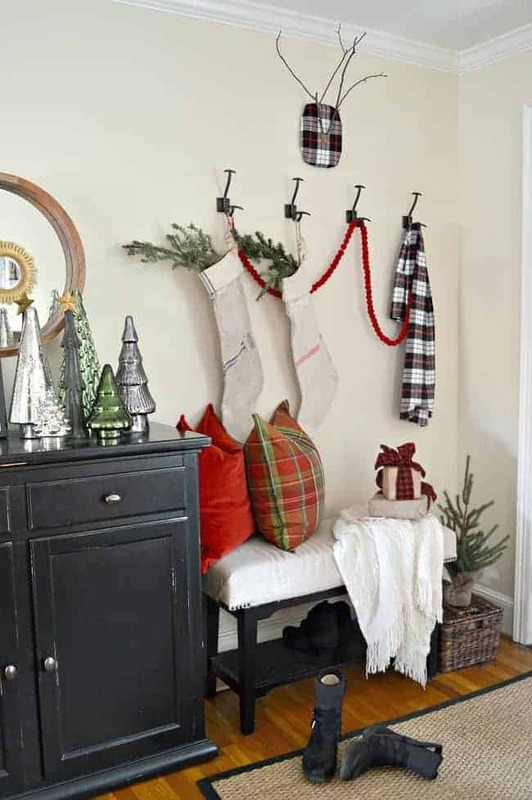 Your home looks so comfortable and cozy decked out for the holidays! Love your dining room!!! I love your home. It’s beautiful dressed for the holidays. Thank you for letting us peek inside. Have a wonderful Christmas in your charming new home. Thanks so much, Jeanette, I truly appreciate it. I love it! Awesome job! This year is the first year our tree is going in the dining room, too. While I will miss having it in the den where we can enjoy it more, the two plusses of the dining room are: there is a good spot for it in there and it can be seen from outside. Thanks Melanie! It seems that there are a lot of us with dining room trees. I think we’re all so used to the idea of a tree being in a family/living room but it’s not so bad having it in the dining room. 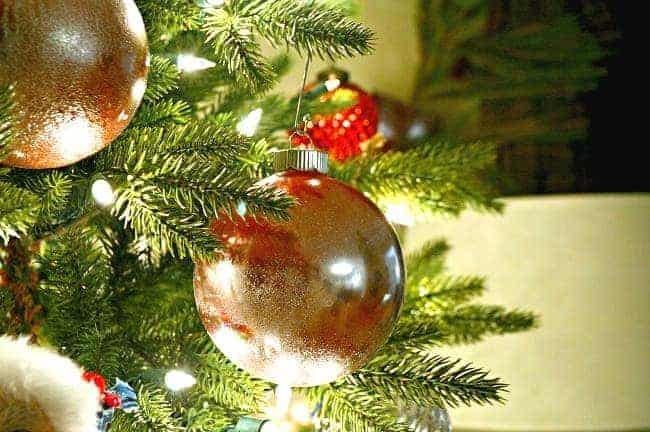 Enjoy your tree! Hey Kristi, as a fellow North Carolinian, glad to have you here! So, just the words ‘1946 stone cottage’ made my heart skip a bit! Looking forward to seeing more of it. And your tree is beautiful! There’s always a trade off. Ours is in our living room and we’re never in there. I’d love to have it where I eat my meals! Think you’ll probably end up loving it there. Thanks for sharing your lovely Christmas decorations! Hi Lynne. I had no idea that you lived in North Carolina, too. So many awesome bloggers from this great state! Thanks so much for stopping in to take a look around and for your sweet comment. Oh Kristie! Your home looks so beautiful! What a wonderful Christmas you will have. Thanks so much, Brenda. I’m looking forward to enjoying the holiday season in our new home with our family.